Ondra was recommended to me by a friend after I fell in love with the cocktail scene in Prague, it’s really something impressive and kind of measures the fast growth of Prague as a city for me. Every year there are new bars experimenting with new ambiance, drinks, and styles of service. We’ve already spoken to AnonymouS Bar as well as Hemingway, two of my favourites on the scene right now. But with Ondra being an award winning bartender, it was impossible to resist some tasty advice on where and what to drink in Prague. Ondra gives a special personal touch to all of the questions I threw at him. A very cool interview, check it out. I come from Prague, the wonderful city full of history. Well, a garbageman at first as they have a huge car. Later it was a professional football player and a car mechanic. But in the end I have a job that fulfills me and I enjoy it. To communicate with people and come up with new creative cocktails? That’s definitely my cup of tea. What was the first drink you ever had? It’s been a very long ago but I remember it quite right, it was vodka and juice. And after that maybe a Cuba Libre…? What competitions have you competed in/won? That’s an impressive list of wins! How would you describe Prague’s bar and cocktail scene? Where should we go for a cocktail? Prague is a historical city and always will be (hopefully). There are many wonderful places that make your heart beating faster and make you come back again. 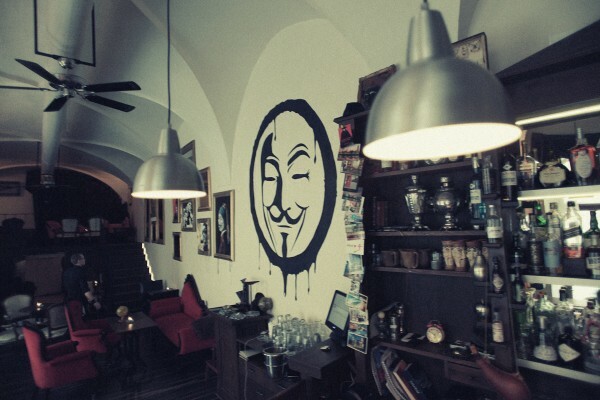 The bar scene has grown in the past few years, not only in Prague but in the whole of the Czech Republic; there are new businesses open with huge potential to become some of the TOP places in the world. There’s also a wide range of bars, old as well as total newbies; everyone can find something they like, there’s such a variety. When it comes to bars – you can do the best in one evening. 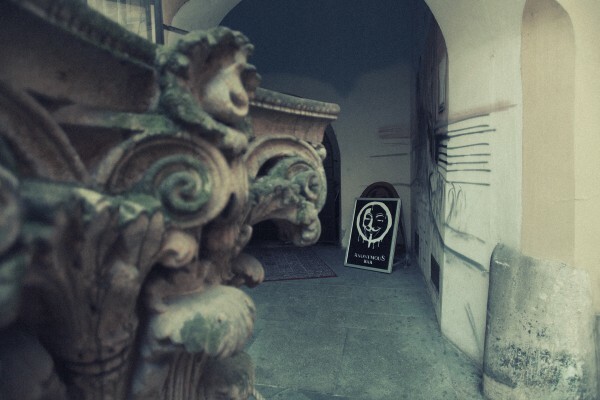 Hemingway bar, Bugsy´s, Cash Only, Black Angel´s, L´fleur, AnonymouS and La Casa de la Havana Vieja are only a fragment of what the city of Prague has to offer. But it’s not only Prague that offers great bars. 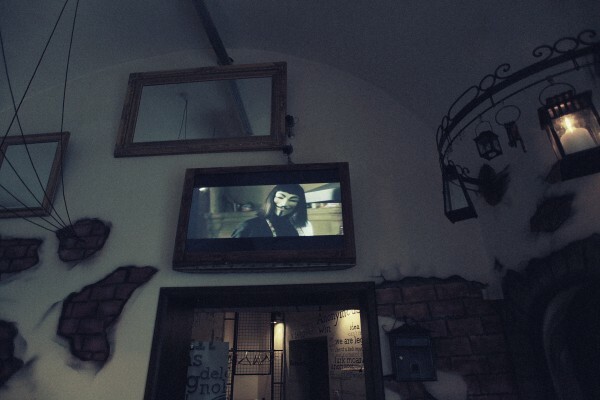 If you happen to be in Brno, don’t forget to visit Bar, který neexistuje (the bar that does not exist, in English) a Super Panda Circus, it would be a shame to miss it! 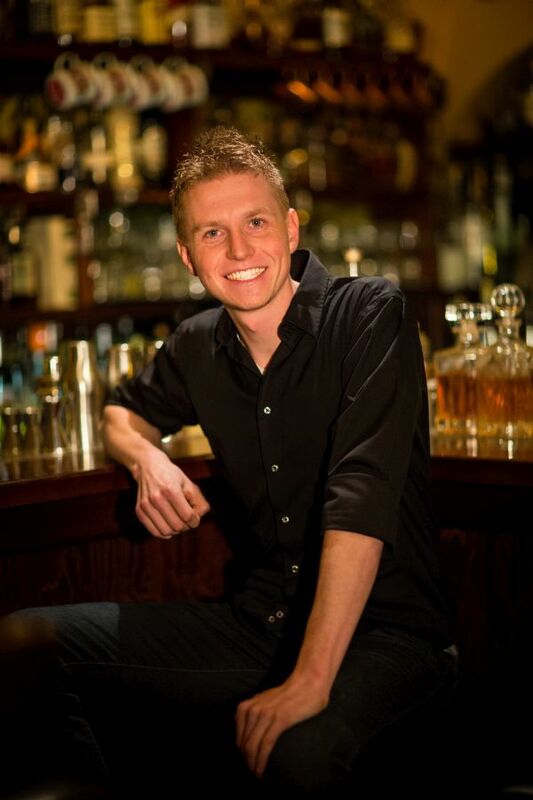 Do you have any advice for young bartenders or bar owners? To be diligent, responsible and enthusiastic, that’s how you can be successful in this job. adrenalin that any minute a cop could come in and we would all be in a big mess.. this attracts me. And if I had another chance to go back in time, I would love to visit the beginning of the 90s when electronic music started to get popular. I would like to experience the atmosphere in the clubs and big parties of that time. Well, Tom Cruise tried in Cocktail and failed 😀 Matthew McConaughey would be the right one. He may be a bit older and not as handsome as me but he’s the best choice. And if he’s too busy, then Adam Sandler, Ben Affleck or Jon Snow could be good candidates. What’s your favourite word in English? Thank you (děkuji) – I use this word each and every day. And I am always happy when I find that other people can use it, too. Over the four years that I have lived here, considerably less than some expats, I feel as though I’ve seen a lot of great things in Prague, as well as a lot of great changes. As I have mentioned before, I do have a love for the booze, but these days booze is no longer just booze but an evolving artform. 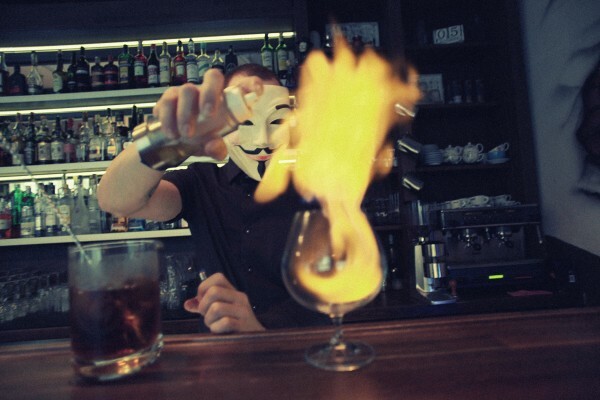 Aleš Půta is one of few bartenders who has brought this art to the Czech Republic. 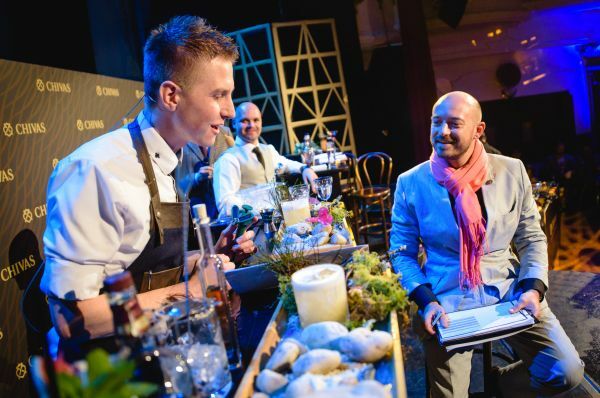 Having spent a large amount of time abroad and researching the best ingredients and recipes for outstanding cocktails, his story is definitely a memorable one. 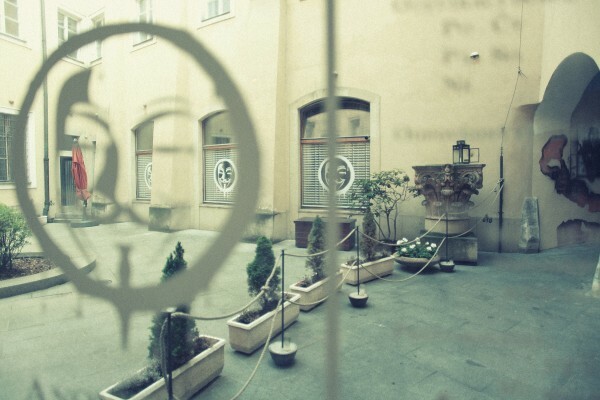 Aleš’ journey with the Hemingway bar in Prague could almost be compared to Ernest Hemingway himself. Like the great writer, the bar has seen its share of intense ups and downs, only to emerge triumphant.. and tasty. Aleš gives us an inside look into his journey as well as letting us in on the perfect ingredients for not only decent cocktails, but a decent bar. From creating cocktails named after Hemingway’s wives, carefully selecting and crafting the beautiful interior and creating a massive selection of rums and quality absinthe, it’s been one hell of a ride. When did it all begin with this bar? We have been open for more than 5 years and this year we’ve received a few awards, so we’ve had a lot of interviews and a lot of interest in the bar. 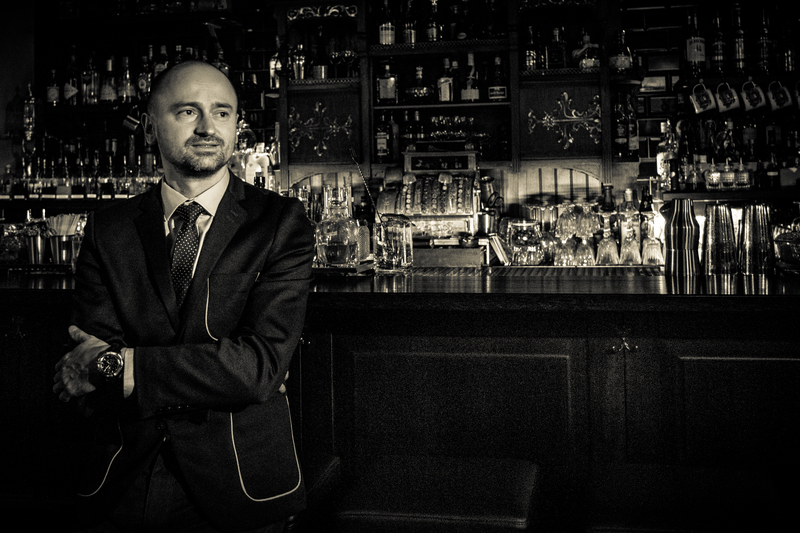 We started in 2009 and I was really happy to open a real cocktail bar in Prague because we are focused on original recipes; we like the old fashioned style cocktails. We also twist classics but today people like more of a sweet taste so we had to take these classics and make them a little sweeter. It was very hard in the beginning because we had very few customers – we were waiting almost one year for nothing, but we stayed and tried to make the best of it. Then after about one and a half years, there came a magical day when everything changed. More and more people started to come. We started with just 3 bartenders, now altogether we have 17. We also now have two bars and we started with 30 seats and now we have over 70. We’re still searching for the best quality cocktails and testing new ingredients. We have a passion for the job. The bartenders even win competitions. We’ve also had a lot of friends from all around the world that have come to help us too. 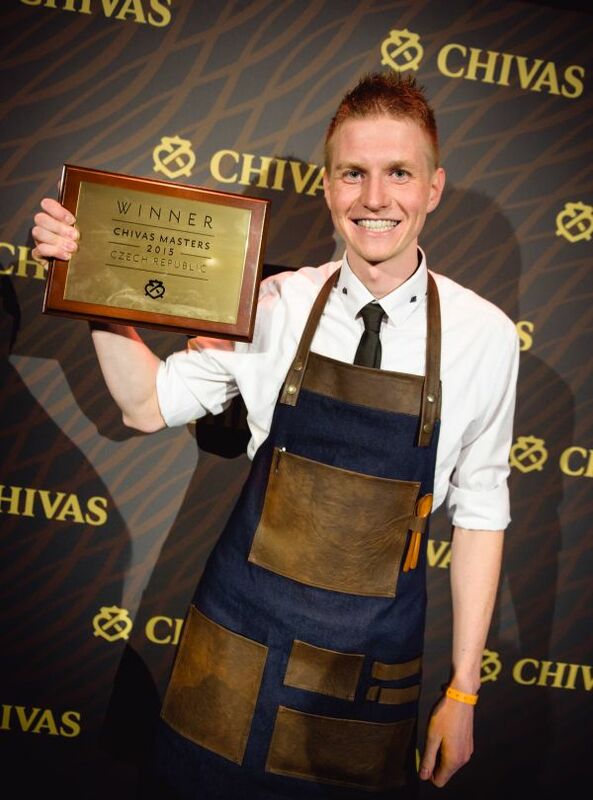 This year we were awarded the 24th best bar in the world. It’s amazing for the Czech Republic. Czech people don’t know about this kind of cocktail culture. Would you say that it’s changing now? Yes, definitely. People are travelling and many tourists come to Prague and they’re always helpful with recommendations. If they ask for a cocktail that we don’t know, we will try to find it on the internet. It’s really different than before. It started in my family. My father and grandfather worked in hospitality. Originally I wanted to be a professional horse rider, but my father told me that I would be in hospitality too. I was really happy because I was 16 years old and I had already done a bartendering course, it was something special for me. It changed my life. So Hemingway, aside from being a famous writer, had quite a dramatic life. He was also involved in a lot of the great wars. If you could compare his life to the life of this bar, would you say that it’s similar? Hemingway’s life was very interesting and honestly he drank a lot.. So yes, and we have a lot of his stories in our cocktails. For example, the ‘100 days cocktail’ which is named after the 100 day ultimatum that Hadley (his wife at the time) gave to Hemingway. If Hemingway could make it through 100 days without seeing Pauline Pfeiffer, then she would grant him a divorce. Hadley thought that Hemingway was just crazy-in-love with Pfeiffer, but after the 100 days he was still in love with her anyway, so she said yes and gave him freedom. How did you first become interested in Hemingway? It was in 2001, I was very young and had a lot of passion for this work, I still do. We had a short video on working flair with cocktails, juggling bottles etc. One Croatian guy and Canadian girl had a bar in Dubrovnik, and they wanted my help to open a colonial style Hemingway bar. So I spent 4 months there helping them with bartendering. It was from this that I got this dream. Then I thought “yes, I will have the best Hemingway bar in the world”. And have you read his books? Do you have a favourite? ‘The Sun Also Rises’, but I actually like reading books about Hemingway, many of our bartenders like his story too. If the real Hemingway was in your bar, what do you think he would say? I think he was a little bit strange, especially before his death. He had paranoia about the FBI and other things… I think he would tell us to shut up (laughs), but he was the most famous barfly ever, so maybe he would like us. If you could compare Prague to a cocktail, which would it be? Well, we really love Becherovka. After the Velvet Revolution, a lot of alcohol came to the Czech Republic and everyone forgot about what was originally ours. Becherovka is unique, it’s very good quality and it’s really different. But, as for a cocktail hmmmm. It’s hard to say. I think our Becherovka cocktail ‘becher butter sour’, which is becherovka infused with ghee butter – this drink is beautiful. Home, I think it’s also one of the most beautiful cities in the world. 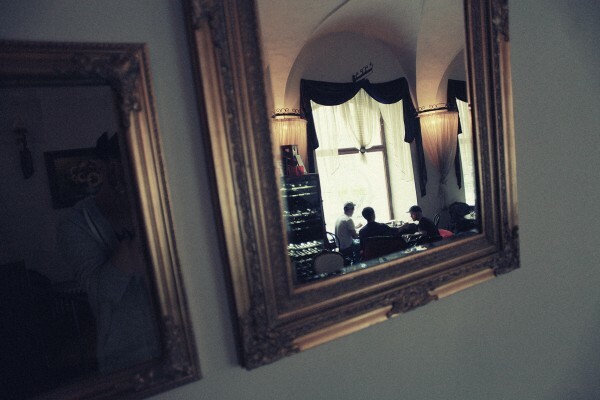 It’s also the main point in Europe, it’s in the centre – a place you have to go to if you come to Europe. People love it… unless they have a bad experience with taxi drivers, but this isn’t only in Prague. I couldn’t say an actor, but I love (director) Miloš Forman. I’ve heard a lot about his life and I really like how he has created films. He inspired me for a few drinks too. I don’t like politics, nor do I like the wasting of materials and things like that, but I don’t think that one person can change something, but maybe I would. So not only would you go back in time, but you would change something? Yes, I have many ideas and many dreams so I would maybe change something about my parents, they are shy and don’t travel a lot. They have given me everything now but because of the communism in the past, they couldn’t do anything themselves. I would change this time, the time when the Russians came. As a bartender, I love the ‘negroni’. I think bartenders all over the world like this drink. For a look at the bar, bartenders, stylish interior and mouth-watering drinks list (which you can download as a PDF) visit the website here. 1. The three souls of the bar. The brothers took inspiration from three stories or ‘souls’ stretched out over the last 400 years. The first being the true story of anti-hero/terrorist Guy Fawkes’ infamous and spoiled attempt to blow up the houses of parliament in London on November the 5th, 1605. 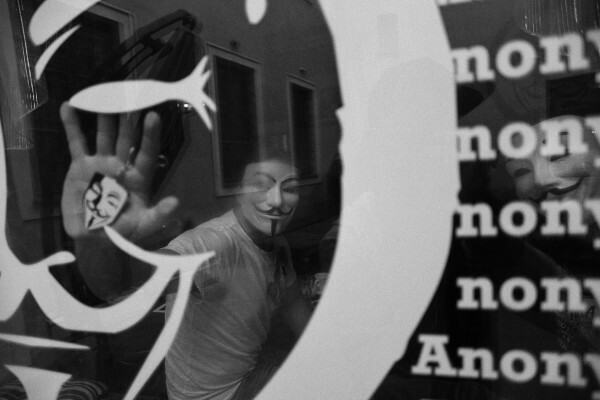 The second soul was created by Alan Moore who wrote the graphic novel V for Vendetta that adapted Fawkes’ face into the mask that many now recognise as being a symbol of revolution and rebellion. The novel was later adapted into a film of the same name starring Natalie Portman. 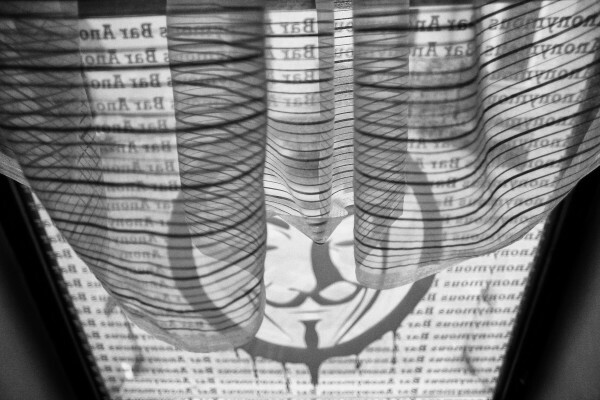 And finally, the third and final belongs to the hacker activist group ‘Anonymous’ who have also used the mask to rebel and expose government data to the general public. What was once an old horses stable has seen a great transformation over the years. The brothers have drawn inspiration from the 3 souls of the bar. 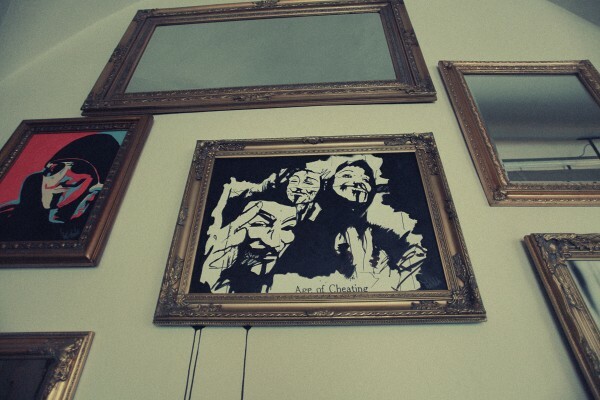 All three can be seen clearly from the handmade furniture to famous and familiar paintings that have been airbrushed with the mask – everything has also been made and designed locally. The brothers have clearly spared no expense and have imprinted their vision and character upon every last brick. Even the toilets have the appearance of Evey’s (Portman) prison cell in the film. Again drawn from inspiration of the 3 souls, each drink has been carefully crafted, selected and named. 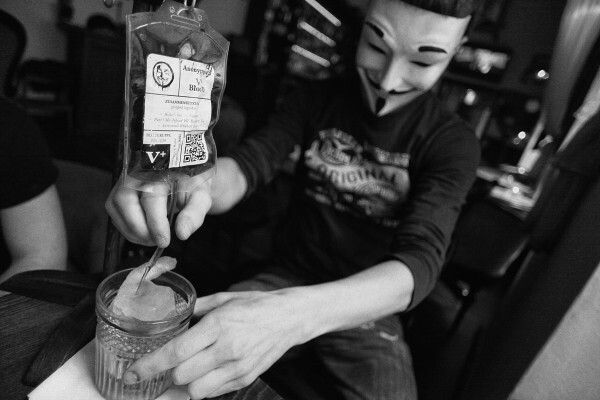 The brothers were kind enough to let Petr and I sample ‘V’s blood’ (named after V for Vendetta) – a blood bag labelled V+ filled with a homemade bitter infused with vermouth and raspberry tea which is then drizzled over a giant ice cube and mixed with brokers gin and campari – based on ‘negroni’, a cocktail made in Italy in 1919….incredible. The bartenders also bring a number of different qualities and entertainment to the hideout. As well as being trained as ‘mixologists’, they also bring charisma, dancing skills and some classy magic tricks. Continue reading for a personal / anonymous interview with the brothers and to also see it all for yourself through Petr’s eyes and lenses. This is truly a spectacle that has to be seen by all. This kind of quality and originality is seldom seen in the Czech capital. Where are you guys from originally? Are you from Prague? 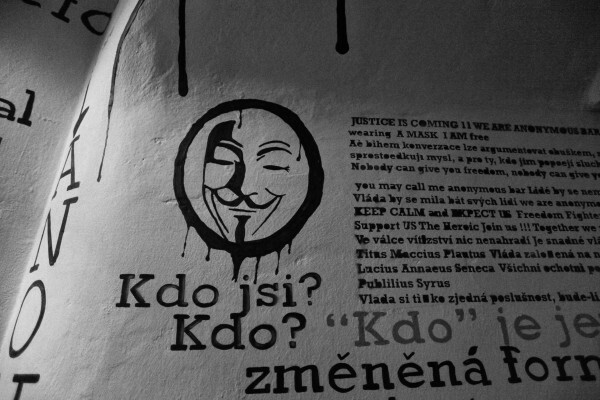 Anonymous 2: Yes, we were born here in Prague in Vinohradské nemocnice. Anonymous 1: Yes, we have a little house there and we live together because we can do a lot of work. It’s good. Ok, so doesn’t it ever drive you crazy that you live AND work together? A1: No, it’s ok (laughs) My brother is a bartender and plans the drinks and entertainment whereas I look after the numbers, the PR etc. How is your bar more unique than others? I know that you pride yourself on your drinks, especially the cocktails. A2: Everything is about how you speak to the customers. Everything starts at the main doors. You start a conversation with them and ask them about their favourite base for the drinks.. Do they like vodka, whiskey, gin? Most people, especially here in Prague, think that a cocktail is just about juice and syrup. We want to show people how you can make and play with spirits and herbs and all these things, you know? Sounds great. And whose dream was it to open this bar? A2: Both of our dreams. A1: When we found this place we didn’t really know what we wanted from it, it started with my brother and his bar work. 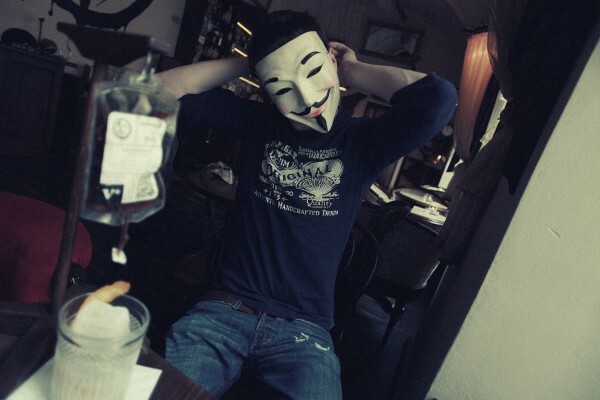 A2: I used to wear the (Fawkes) mask while I worked. 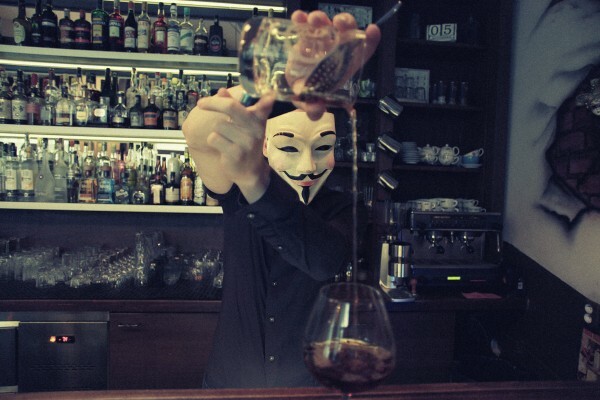 I travelled in Europe doing a bartender’s competition and this mask became my image. 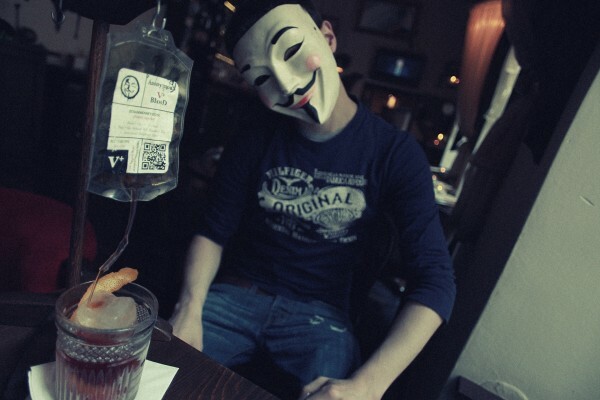 And why this mask specifically? Is it because you want to remain anonymous? 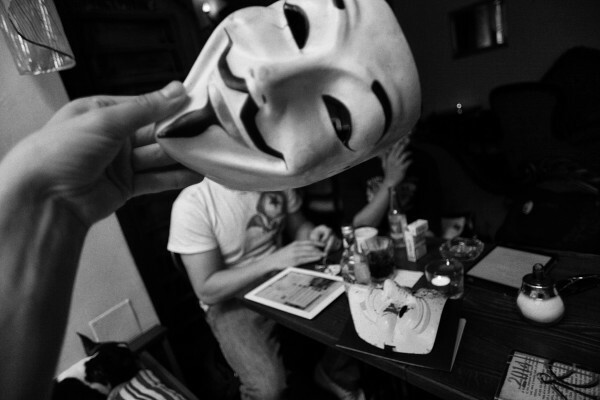 Are you in the hacker activist group? A2: If we were, do you think we would tell you? No (laughs). But it was worth a try anyway. A1: A lot of people don’t know what this mask means. 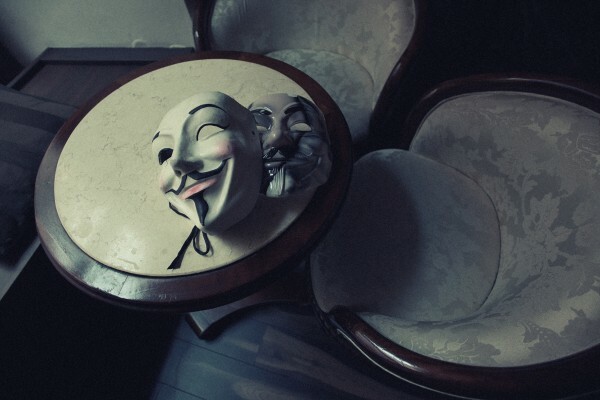 Some people know it from Anonymous, but not many know where it originally came from. And that’s what we want to do; we want to explain the history of this face and of course to talk about V for Vendetta and ‘Anonymous’. A2: Before we were here it was a strip bar, a typical one. 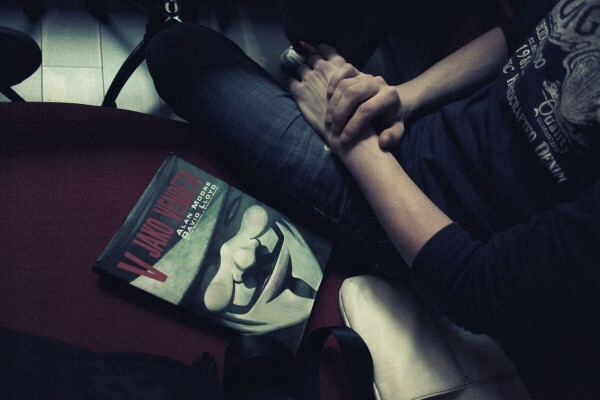 A2: I knew the story behind the mask and I suggested it to my brother and thought hmm… that could be cool! So we put our ideas together and combined the three ‘souls’. Everything has a reason – it all started with this mask. 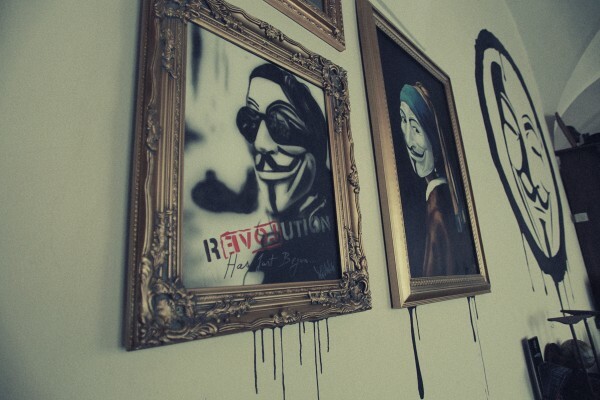 V’s terrorist hideout was the reason for our interior design here. Every original bar must have a concept. 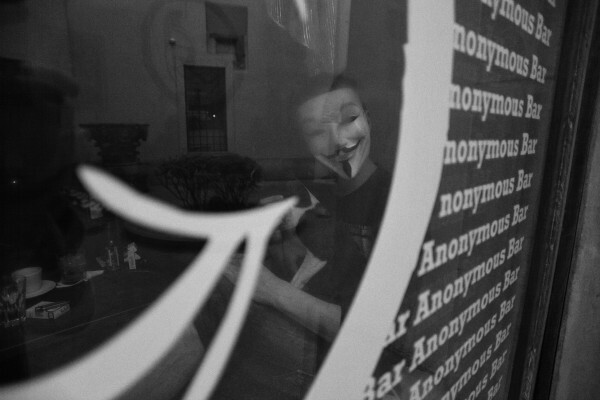 A1: We have similar ideas to the hacker group ‘Anonymous’. We don’t have any brands here. We don’t have a deal with Coca-Cola or Absolut vodka. Everything here is from us. We don’t like the mainstream. A lot of bars here have too many brands. A2: We have a motto here. It doesn’t matter who you are or where you’re from. 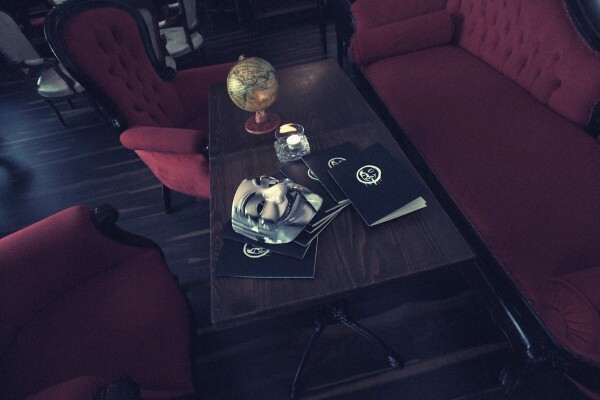 Come to our hideout and relax. It looks a lot like the real hideout from the film. I think people are going to be impressed! Have you ever had any really intense fans that actually come in wearing the mask already? I’ll be honest.. I probably would. A2: Not many, but some people from all over the world directly come with the mask and of course we give them a bit of a bonus because we love this. Great. I’ll bring mine next time then! A2: We have had some very interesting customers. But we won’t talk about them because everyone has the chance to remain anonymous here. We don’t collect emails or any personal contact information. You can organise reservations through Facebook, but that’s it. 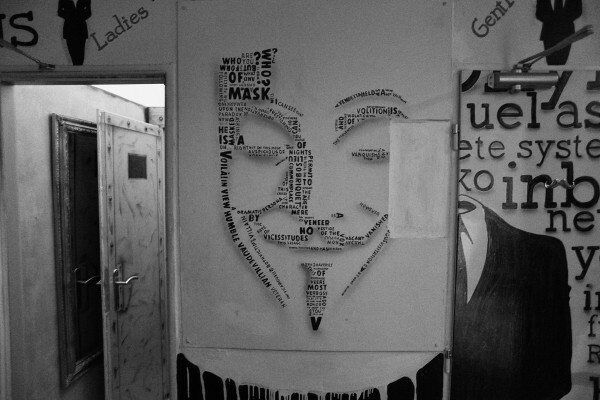 Ok, now Guy Fawkes was seen as a bit of an anti-hero in English history. A terrorist, but also as a freedom fighter. After all, they celebrate this day every year by lighting bonfires in London. Do you think that the Czech Republic has a similar anti-hero in its history? A1: Yes, maybe Jan Palach.. He burned himself in protest against the Russian occupation. 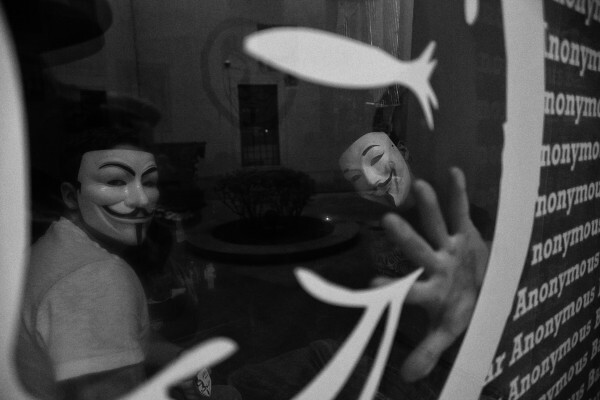 And what do you generally think about the hacker group? Do you support them? Are they active in Prague? A2: We’re not going to tell you! (Laughs) On Facebook we get sent a lot of invitations to participate in events. They are actually raising awareness about plastic foreign objects in food in the US right now – we support them not by joining them, but in our own personal way. A1: The Monkey 47 gin and tonic, it’s an old one from Germany. The gin is of a very high quality. A2: And mine, 100%, is the New Orleans Fizz – gin, egg whites, fresh lemon, lime, sugar, vanilla, cream soda and orange flower water. The egg whites combine the flavours together. You must shake the drink for 10 minutes, which sometimes can take a while on a Friday (laughs). It’s originally from nineteenth century New Orleans. But, my favourite drink also depends on how I wake up in the morning. And A2, what inspired you to get into mixology? A2: It was all about studying and reading about it. And of course also trying everything behind the bar and experimenting. What advice do you have for people planning to open their own bar? A2: You must love it and you must find people who think the same way as you. Now in this age, it’s not easy to survive – so you need a lot of friends to help and support you, like we do. What you imagine in your head – put it in your hands. Sounds cool. Now onto our People in Prague questions! How would you describe Prague? A1: It’s crazy. Every night in Prague is crazy actually. A2: And weird. I mean, everywhere here you can still smoke in restaurants. Czech Republic and Albania are the only countries left in Europe that are doing this. A1: If I could choose I would like to see the Czech Republic in the 16th century or Prague in the 13th or 14th century. Or 16th century in London. I would love to see New York City during the financial crisis – Black Friday. A2: In 1830, the godfather of bartending Jerry Thomas created all of these drink categories. 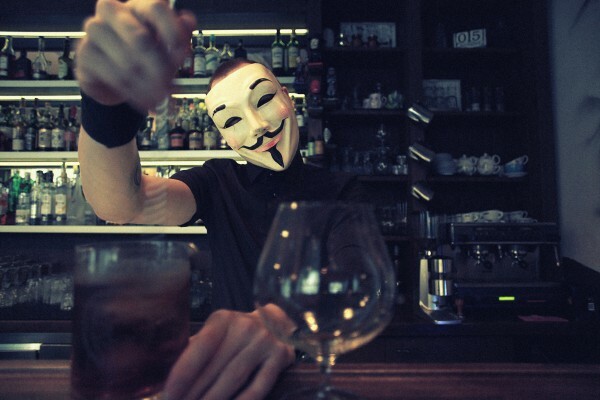 I would like to have him here in the bar. And Finally, for the silliest question… Do you think Natalie Portman has a bad English accent in V for Vendetta? A2: There are always three teams of people; those who love it, those who hate it and those who don’t care. But for me, Natalie Portman promoted the film, she put the story out so I don’t care about her accent because she did a good job… and she’s very beautiful of course. For more information or to make a reservation, refer to their Facebook page or website.